The SkyVUE™PRO LIDAR ceilometer measures cloud height and vertical visibility for meteorological and aviation applications and is ideal for long-term research applications where a high level of detail is required. Its robust construction is ideal for long-term installation, as it requires minimal maintenance and features a unique stratocumulus calibration procedure—allowing the ceilometer to be calibrated in the field. The SkyVUE™PRO complies with CAA, WMO, and ICAO guidance and meets or exceeds all recommendations and specifications, including CAP437, CAP670, and CAP746. With an operational reporting range of 10 km, the SkyVUE™PRO is easy to use yet boasts advanced signal processing and unique optical arrangements to provide superior resolution and performance. The SkyVUE™PRO has many standard features, from a tilting base and two-axis inclinometer for automatic correction of cloud heights to heaters, blowers, and a sun filter for operation under all conditions—making deployments possible around the world. Unique standard features include an easy-to-operate stratocumulus calibration, long-life back-up battery, and twin clocks to augment its many continuous diagnostic self-checks and provide assurance of continuous, reliable, and accurate performance. The SkyVUE™PRO LIDAR ceilometer measures cloud height and vertical visibility for meteorological and aviation applications or long-term research applications where a high level of detail is required. Using LIDAR (LIght Detection And Ranging) technology, the instrument transmits fast, low-power laser pulses into the atmosphere and detects backscattered returns from clouds and aerosols above the instrument. A unique, efficient single-lens design increases optical signal-to-noise ratio and allows for larger optics in a compact package, improving accuracy and measurement performance. The optics are immune to damage from direct sunlight. This approach, along with state-of-the-art electronics, provides a powerful and stable platform from which to measure cloud height and vertical visibility to high accuracy. The SkyVUE™PRO measures the atmosphere with high stability and repeatability, delivering excellent performance in even the harshest of conditions. The SkyVUE™PRO provides information on cloud height, sky condition (up to five layers), vertical visibility, and raw backscatter profiles to a range of 10 km. An automated Mixing Layer Height (MLH) option is available for air-quality applications. MLH is an important parameter in modelling air quality and air pollution episodes. The MLH is determined based on the operational algorithm used by KNMI, which detects the top of boundary layers. The algorithm runs within the SkyVUE™PRO itself, and the results are incorporated in data messages, making it easy to incorporate the MLH into whatever systems are already in use without the need to run external special software. If you require the MLH option, please contact us. The unique stratocumulus calibration capability, which allows users to calibrate measurements of scatter coefficients, uses a simple and user-friendly field method, giving complete confidence in the scatter profiles reported and removes the requirement to have the unit sent back for calibration. Reliable range measurement is further assured by cross-checking two separate internal quartz clocks, eliminating the possibility of unidentified errors due to clock drift. The SkyVUE™PRO can be tilted at various angles up to 24°. A small tilt is important, as it allows the ceilometer to resist high levels of reflection from large raindrops and frozen particles that can impair vertical-type sensors. The tilt also improves rain run-off on the ceilometer window, resulting in a much higher performance compared with vertical ceilometers. Tilting to 24° also means that it can be operated anywhere in the world without the sun shining into the lens and resulting in missing data. An internal two-axis inclinometer provides automatic correction of cloud height at all angles, ensuring ease of installation and confidence that cloud heights are automatically corrected throughout the lifetime of the installation. Ceilometer data can be displayed using Campbell’s Viewpoint software or fed directly into existing data systems. The Campbell Viewpoint software will display the output from the ceilometer in a convenient and configurable form, including information on sky condition, mixing layers, and scatter profiles. All can be displayed simultaneously or separately with ranges and time scales. For more information on Viewpoint click here. Provides 2 h measurement, without blower/heater, in the event of mains failure. Campbell Viewpoint is viewing software designed to accompany the Campbell Scientific optical sensor range, including the CS135 ceilometer, CS120A visibility and CS125 present weather sensors. It is free to download and use for 100 hours, after which you will need to purchase a key to continue using it. It is available with single or multiple sensor viewing options and also with data logging capability, please contact your Campbell Scientific office or representative for further information. 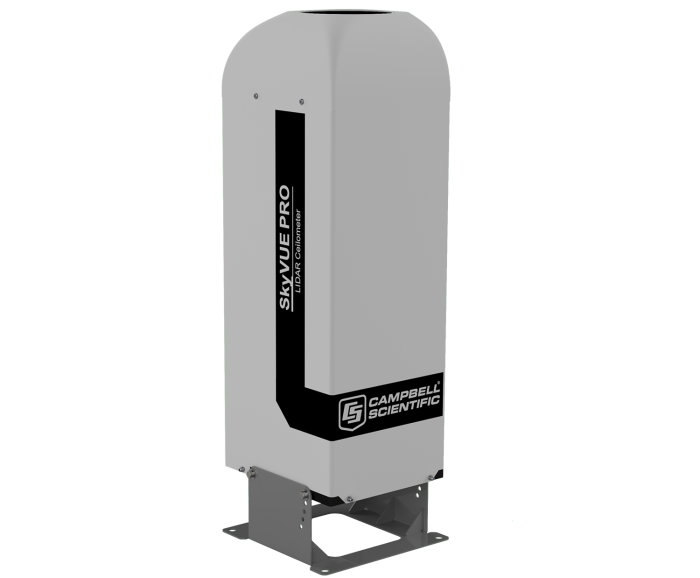 Campbell Scientific has introduced a new operating system, OS12 for the CS135 ceilometer. It is fully backwards compatible. OS12 is available free of charge. OS12 has introduced improvements to the optical overlap correction function. This has corrected previous over-sensitivity to signal returns at very low altitudes. This change results in the reduced detection of false, fixed-level, low cloud height reports during some types of rain and the reporting of cloud layers when there are returns from low lying layers of mist or pollution.